On September 26, Mr. Masataka Fujita, Secretary General of the ASEAN-Japan Centre (AJC) had a bilateral meeting with H.E. Mr. Chen Dehai, Secretary-General of the ASEAN-China Centre (ACC). 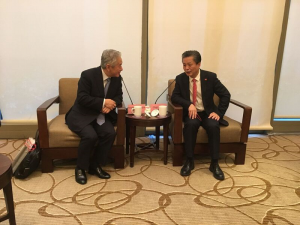 SG Fujita expressed his appreciation to SG Chen for the invitation to “2018 ASEAN “the Belt and Road” Tourism Culture Exchange Week” in Guiyang. Secretaries General of two centres agreed to continue strengthening their relationship in the context of ASEAN+3. They also discussed the promotions of increasing the tourist traffic among ASEAN+3, and sought the possibility of joint programs on the topic of the global value chain (GVC) in the East Asia. Mr. Masataka Fujita, Secretary General of the ASEAN-Japan Centre and H. E. Mr. Chen Dehai, Secretary General of ASEAN-China Centre.